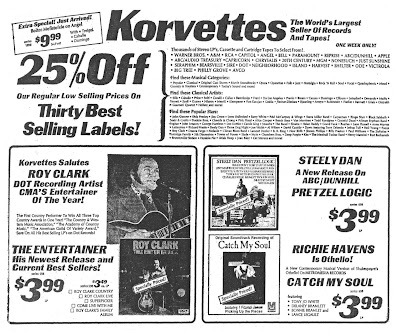 The recent passing of actor Patrick McGoohan (January 13, 2009) and musician Delaney Bramlett (December 27th, 2008) got me thinking about this m.i.a. 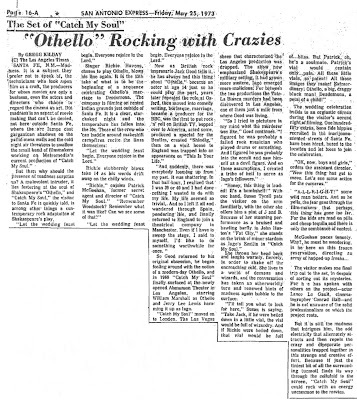 musical from the early '70s, a film adaptation of Jack Good's rock-opera version of Shakespeare's Othello. 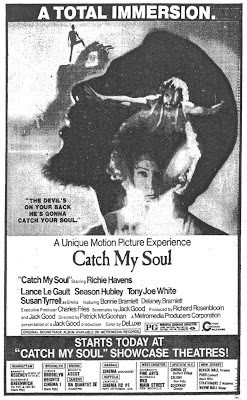 Directed by McGoohan and co-starring Bramlett (who also worked on the soundtrack), CATCH MY SOUL was filmed in Santa Fe, New Mexico in late 1972. According to a 1995 interview with McGoohan for Premiere magazine, one of the producers "found God" during the production and drastically recut the movie, adding over 15 minutes of religious material. McGoohan tried to remove his name but was unsuccessful. Cinerama Releasing opened it in New York City in March of '74 to bad reviews and poor audience turnout. 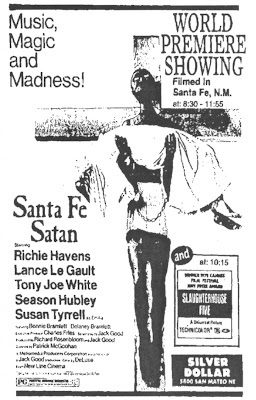 A year later New Line Cinema was distributing it under the title SANTA FE SATAN, and although it was available for rental from the company's non-theatrical 16mm catalog for a number of years, it now seems to have fallen off the radar entirely. Shakespeare’s “Othello” gets a modern rock treatment in Cinerama’s release of Jack Good’s CATCH MY SOUL. Singer Richie Havens leads an impressive cast in a most unusual entertainment. Good’s screenplay is set in a religious commune where rock in the order of the day. Othello (Havens) is a preacher, the other characters being members of his flock. Lance LeGault repeats his London stage performance in the film as the Satanic Iago, singer-composer Tony Joe White is the hapless Cassio, Season Hubley has little to do as but look pretty as Desdemona and Susan Tyrrell interprets Emilia. The male leads are particularly strong personalities, doing a fine job of acting with the original prose and singing the up-to-date songs. Miss Tyrrell makes the most of the one comic number, “Tickle His Fancy.” Songs are a collaboration by most of the cast – Havens, White, Delaney Bramlett, Family Lotus, Allen Lubin, plus Good and others. 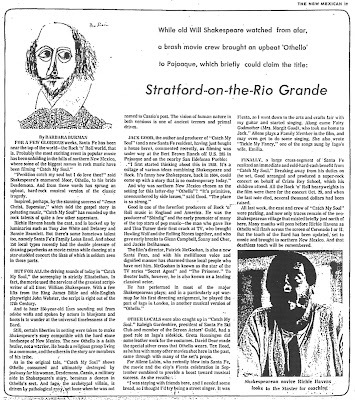 Conrad Hall shot in DeLuxe Color in Santa Fe, N.M. Shakespearean actor Patrick McGoohan (who was Iago in another modern version, ALL NIGHT LONG) makes his feature film directing debut. Good and Richard Rosenbloom produced. A Metromedia Producers Corp. presentation. For specialized houses. A religious commune in the Arkansas backwoods is the locale for this modernized rock version of Shakespeare’s “Othello.” Preacher Othello (Richie Havens) baptizes his disciples as the devilish Iago (Lance LeGault) jealously looks on and plots his actions. At the wedding celebration of Othello and Desdemona (Season Hubley), he discredits Othello’s apostle Cassio (Tony Joe White) by burning the church and blaming it on him. Taking Cassio’s place, Iago has his wife Emilia (Susan Tyrrell) steal Desdemona’s handkerchief. Planting it in Cassio’s house, Iago then convinces Othello of Desdemona’s unfaithfulness. Othello strangles his wife in anger, then learns the truth from Emilia. Othello and Iago stab each other, the disillusioned preacher dying and Iago driving off in his truck. Emilia, hit by the truck but unhurt, is united with Cassio in grief. Tie-ins with the soundtrack album, available on Metromedia Records, and with albums of the recording talent involved are in order. Mention Patrick McGoohan’s acting credits: ICE STATION ZEBRA and THE MOONSHINE WAR on screen, SECRET AGENT on TV, etc. Fox seems to have inherited all the Metromedia Producers Corporation assets - maybe one day this could pop up on Fox Movie Channel? Kings and Desperate Men - another McGoohan film that has vanished. Santa Fe Satan was recently shown at a film festival in North Carolina. On DVD-Blu Ray this month thanks to Etiquette Pictures! SHATTER (1974) meets the Destructible Man! Stay up with Jerry and watch...the Oscars?! 42nd Street vs. Chi-Town, part two! And now Toronto jumps into the ring! "Jackie puts judo hold on newsman"